After doing more than 24 hours of new research and testing—including interviews with several professional photographers—on top of 60 hours previously spent reviewing camera carrying gear, we’ve found the best bags (both backpack and messenger style) and straps to keep your equipment organized and protected in the field. 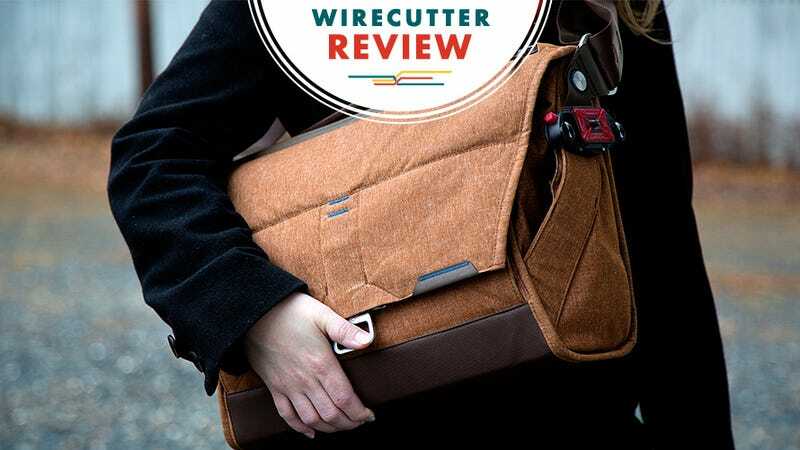 This post was done in partnership with Wirecutter, a buyer’s guide to the best technology. This is a condensed version of The Best Camera Bags, Straps, and Accessories to Carry With You; read the full review here. If you need to carry multiple camera bodies, lenses, accessories, and a tripod, you should look for a backpack. (If you need a great tripod, we have a recommendation, and a travel-sized pick as well.) A good camera backpack will distribute the load evenly so that you can carry large amounts of equipment for long periods but still keep everything protected. The ideal bag will offer multiple ways for you to access your gear—you might not even have to take the bag off your back to do so. On the other hand, if you’re not carrying a ton of gear, a messenger bag gives you easier and quicker access to your kit. It’s perfect for one DSLR or two mirrorless cameras (depending on size), as well as a few lenses and accessories. And messenger bags usually also have room for a laptop and tablet. But keep in mind you’ll be putting all that weight on one shoulder, so messenger bags aren’t as suitable for extended use as backpacks are. Regardless of which bag style you prefer, we recommend getting a nice strap for the camera itself. The strap that came with your camera is a lot like the lens that came with it: It’s good enough, but not really anything special or particularly useful. An upgraded camera strap will be more comfortable for lugging your gear long distances, can support more weight safely, is more stable (to prevent the camera from banging around as you move), and will allow you to get a camera to your eye faster. The consensus among our photography pros was that Think Tank and MindShift (sibling companies) bags are comfortable, organized, reliable, and capacious. According to professional photographer Mason Marsh, the MindShift Backlight 26L “is a wonderful compromise between bring-it-all capacity and comfortable compactness. I carry a Sony A7R Mark II, two Zeiss Batis lenses, a Canon 70-200 F/2.8L or 100-400 L, Canon 50 F/1.2L, Canon 11-24 F/4L, and a mess of accessories.” If you want something smaller, consider the Think Tank Urban Approach 15, the bag that PCMag’s Jim Fisher relies on when he’s out shooting and walking nature trails or for weekend trips. Derrick Story, aka The Nimble Photographer, opts for the diminutive Lowepro ProTactic 350 AW because “it’s durable, comfortable, and provides access from three sides. It’s also easy to secure from intruders.” He also said, “I like its rugged tactical appearance.” And it’s more than just looks: That external webbing matrix is perfect for strapping on accessories and pouches, if you need additional storage. We have much more information about camera backpacks in our full guide. The Peak (left) is a universally loved bag designed by and for photographers. The Tenba Cooper (right) has a more refined look for a bit extra. Pros and other reviewers universally recommended the Peak Everyday Messenger as the best messenger bag. Mason Marsh thought it offered “the very best combination of materials, construction, utility, and style.” Wirecutter writer and professional photographer Jeff Carlson explained: “I can tote my Fuji X-T1 around in it without feeling like I’m carrying a camera bag.” Also, Popular Photography named the bag one of the best pieces of gear of 2015. If you want something a little more business-casual friendly, our interviewees recommend Tenba’s Cooper line of bags. “I think this messenger is just crazy handsome,” said Derrick Story. “So many nice touches, such as the rear trolley strap. Great placement of pockets. And made from material that should wear beautifully.” Chris Gampat of The Phoblographer is also a fan: “This … accommodates my mirrorless cameras, laptop, and even flashes and lenses very well.” The Tenba Cooper and Peak Everyday Messenger will each set you back more than $200. If you want to spend less than that, Tenba’s other messenger bags are as reliable as the Cooper bags—and often much more affordable—but not as stylish. The Tenba Messenger can be had for as low as $60 at times, while the Tenba DNA line runs between $100 and $200. We have much more information about camera messenger bags in our full guide. Our first priority for testing straps was to examine the best reviewed ones that have been on the market the longest and to recommend a functional product that outperforms the strap that comes with your camera. We also sought out a strap that contours well to your body and can stand up to a DSLR with a heavy lens (a Canon 5D Mark III and Canon 70-200 telephoto lens, in our testing). We found that the BlackRapid Sport strap met all our criteria for less than $100. You can attach it to the camera via the tripod mount, using a stainless steel thumbscrew and metal carabiner. That carabiner connection has been a point of failure on the strap for some users, newer Sports have a locking mechanism on the carabiner as well as an additional plastic piece called a LockStar (developed in partnership with Nikon) that prevents the carabiner from unlocking and keeps the metal hardware from scratching the camera body. Though more expensive and marginally less stable compared with the BlackRapid, the Luma Labs Loop 3 offers a sleeker and more refined look while still being comfortable for you to use for long periods of time. But it also costs about $25 more than the BlackRapid and lacks the locking mechanism to keep the camera from sliding around the strap when you don’t want it to. If you want to spend substantially less, OP/TECH’s Utility Strap – Sling stands out for its thick neoprene padding and alternative camera strap connection loop attachment method that doesn’t interfere with the camera’s tripod socket. The strap’s Uni-Loop Connectors feel very secure and require a squeeze on both sides to release. You can use more than one strap for more carrying options, if your battery grip or quick-release plate also include a loop. That said, paying more for a BlackRapid will get you a more contoured and comfortable strap that looks better. We have much more information about camera straps in our full guide.